In the past few years keeping koi fish in ponds is becoming more and more popular. 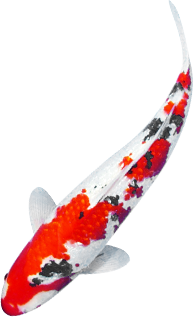 A Koi carp or Cyprinus Carpio is better known under the name Japanese koi carp, often abbreviated to Japanese koi or simply koi. It is a splendid coloured fish, which, under favourable conditions, can grow to a length of 28 to 32 inch and may become as many as 40 years old. A koi carp will be soon trained to the hand and will even eat out of your hand. A koi pond should be at least 60 in deep (preferably deeper still). This necessary to keep the temperature in the pond as constant as possible and for the fish to hibernate. For the number of koi in your pond you should go by the rule, one fish per 1,000 litres of pond water. Koi carps and plants can not go together in a pond. A koi carp has the characteristic feature to dig roots up. It is therefore difficult to keep plants alive in a pond with koi. Reason why in a koi pond always use is made of extensive filter equipments which will keep water clean and healthy. After all plants can not do that job. Only the best feed is good enough for a koi carp. Therefore take care that koi feed contains Chicory ingredients. This is enormously effective for the digestion and the well-being of koi. Feed containing a vitamin complex is recommended because it will always keep resistance of koi to the level. In spite of good feed and a healthy pond a koi carp can fall ill. Special medicines have been developed for koi carps in case they should fall ill.
Owing to its bright colour combination a koi carp is not only attractive for a pond owner, but also to birds of preys (herons) and cats. There are different animal-friendly solutions for fish protection. They will enable you to keep herons and cats at a distance. Pond: Minimum 60 in deep, no pond plants (unless in floating baskets), extensive filter equipment.